The Rev Sylvester Holima prays with Hawa Bockarie, bereaved wife of the Rev. Samuel Bockarie, who died of Ebola. He prays for God's strength and provision for the family. Ebola cases are rising sharply in Sierra Leone with 111 new cases reported Sunday, Nov. 9. The United Methodist Ebola Response Team based in Freetown is responding with spiritual and physical nourishment in the north and west areas of the country where the disease is spreading rapidly. Mohamed Dumbuya was overcome with emotion when the team from the Sierra Leone Conference arrived with gifts of food and words of consolation for the passing of his wife, Mariatu Kamara, who recently died from Ebola. Kamara, 38, was a teacher at the United Methodist primary school in Makeni. “The only way I am coping is by trying to accept that Mariatu is gone forever and that she will never come again. That is the reality of my situation but it is difficult to accept,” he said between sobs. Mariatu Kamara left behind two children, Abu G. Dumbuya, 16; and Memuna G. Dumbuya, 7. Much as Dumbuya misses the love of his late wife, whom he describes as “hard working and sincere,” he is also worried about the future because the family will miss Kamara’s income and support. “She always spent all her income in running the home and making sure our children were comfortable,” Dumbuya said. Dumbuya, also a teacher at the Saint Francis Secondary School in Makeni, said his family had not received support from any agency since he and his two children were quarantined following Kamara’s death about two weeks ago. 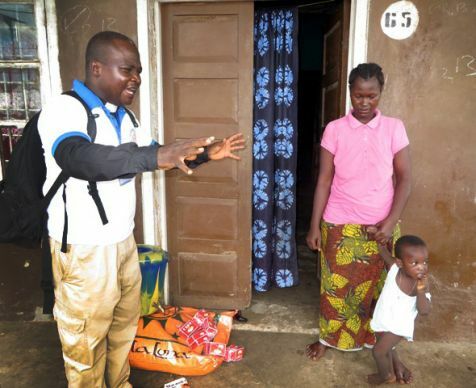 Isatu Koroma and her 9-month-old baby died of Ebola, and her husband “was taken away by persons unknown to the other neighbors now in quarantine, thereby creating the possibility of spreading the virus to wherever he was taken to,” said a neighbor John M. Kanu. Kanu, who is living in quarantine with 36 people, said he understands and agrees with quarantines to prevent the spread of Ebola. He and his family opted for voluntary quarantine. “You might control quarantined residents in the day using police or soldiers, but you cannot at night,” Kanu said. A recent presidential declaration isolated the Bombali District, which includes Makeni, as well as two other areas because of the rapid increase of Ebola in the districts. Makeni is the provincial headquarters of the north and home of President Ernest Bai Koroma. Before the Ebola quarantines, it was a business hub known for its busy streets. It was also a popular place for relaxation for employees of two nearby mining companies—African Minerals and London Mining. The streets, hotels and entertainment centers are now empty. The United Methodist task force members visited several families who all told tragic stories about lost loved ones. At another quarantine home, Hawa Bockarie, widowed by the death of her husband, the Rev. Samuel Bockarie, looked confused and was unable to talk about the future prospect of their four children. Her husband was the sole breadwinner for the family, she said. Bockarie was taken to the Makeni Government Hospital for high blood pressure and caught the Ebola virus while there, she said. Margaret Bockarie, 9, Theresa Bockarie, 6, Matilda Bockarie, 4 and a 21-month old boy will have an uncertain future after the 21-day quarantine, the worried mother said. “Margaret was promoted to class three and Theresa to class one at the end of last academic year. Matilda was to start school this year,” she said. Now, the unemployed mother is responsible for their school fees and care. The team donated a bag of rice, bars of soap and a sanitizing bucket, and encouraged the mother of four to practice regular hand-washing. At another home, 37-year old Joseph Turay mourns the loss of his wife Mariatu Sankoh, 22, and daughter, Fatmata. A third family member, his nephew Augustine, is reported to be doing well at Kailahun Ebola Epicenter in eastern Sierra Leone. Turay said the last two tests showed that despite improving, Augustine still had the Ebola virus, so it was not safe for him to come home yet. Hawa Conteh, a single mother under forced quarantine, was comforted by the United Methodist team and given food and cleaning supplies. “I am a tenant here in this house. A man who travelled from abroad died here before I became a tenant. I am told that the family secured a certificate to allow them bury him. Another person died again in this same home one week after the burial. Health officials came to quarantine our home afterwards. 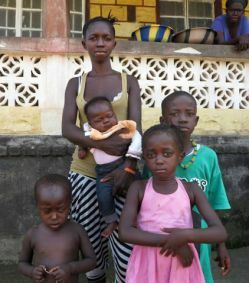 I later learned the deaths were Ebola cases,” Conteh explained through his tears. Teams of United Methodists have been taking the life-saving messages of how to avoid Ebola, when to seek medical attention, and ways to prevent the disease from spreading since the outbreak in West Africa started in May. Confirmed cases of Ebola in Sierra Leone from the National Ebola Response Center are 4,435 with 1,133 deaths. News media contact: Kathy L. Gilbert at (615) 742-5470 or newsdesk@umcom.org.